All of the 20 existing armadillo species live in the Western Hemisphere, but only one -- the nine-banded armadillo -- lives in the United States. The rest reside in Central or South America. Although differences exist between how the separate species raise their young, there also have some similarities. Before armadillos can start raising their young, they need to mate in order to produce a litter. Many species partake in some form of courtship ritual before they breed, but these rituals vary between species. For the majority of species, regardless of where they reside, breeding season occurs somewhere between April and June, during which females will mate with one or two males and males will mate with one to three females. 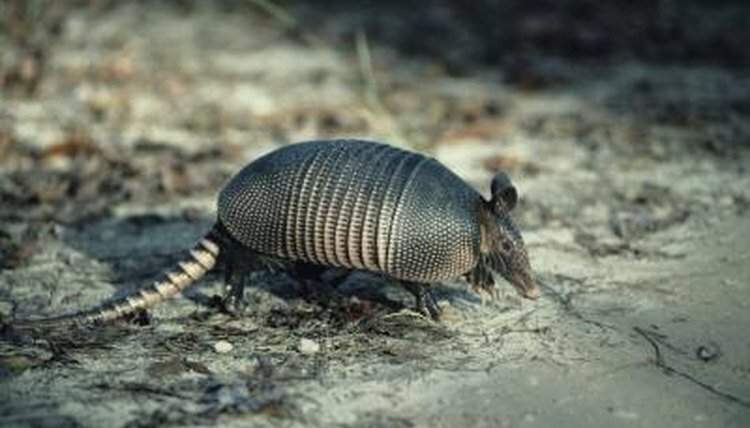 The gestation period ranges from 60 days in large hairy armadillos (Chaetophractus villosus) to four months in giant armadillos (Priodontes maximus) and nine-banded armadillos (Dasypus novemcinctus). Some species can pause implantation of the embryo for a period of four months to two years, thus delaying pregnancy. Mating is the only part that males will have in the raising of their young. Female armadillos raise their young in burrows that they dig using their large, shovel-like front claws. While armadillos sleep and spend time in their burrows all year long, they are extra careful in choosing burrows in which to nest. It needs to be safe and secure in order to keep the young from harm. Mother six-banded armadillos (Euphractus sexcinctus) will pick up their young and move them to a new location if they feel their burrow is unsafe. At the end of their gestation period, female armadillos give birth to between one and 12 young, depending on their species, but usually between one and three. Nine-banded armadillos nearly always give birth to four young who are all identical, having developed from the same egg. Newborns of some species are more developed than others; for instance, baby giant armadillos are born blind, whereas nine-banded armadillos are born with rudimentary dorsal armor. However, all need near-constant care from their mothers and survive solely on their milk for the first few weeks of their lives. Once the young armadillos are ready, the mother will allow them to come out of the burrow with her and start foraging for food. The age at which this happens varies according to species. Juvenile nine-banded armadillos normally start to venture outside after two to three weeks, but southern three-banded (Tolypeutes matacus) armadillos remain blind and deaf for the first three to four weeks of their lives. Even after the young start foraging for food, they're still fed by their mothers until they're fully weaned at about 4 to 5 months of age. After weaning, they usually stay with their moms for another couple of months before heading out alone into the big, wide world.